The Genting Highlands Resort and theme Park must be seen to be believed. It is really hard to imagine why anyone would take a masterpiece of nature like the majestic mountain Gunung Ulu Kali and install on its summit such a ghastly monument to man-made tackiness. However, just like the Frankenstein monster, this brainchild of entrepreneur Tan Sri Lim Goh Tong, was born of the best of intentions. In 1961, while working on a hydro project in the surrounding Cameron Highlands, the picturesque (and cool) playground of British Colonials, Tan Sri Lim Goh Tong conceived the bold, philanthropic notion of building a resort in the hills which would be affordable and accessible to all Malaysians. The idea was considered inconceivable. The feat was believed to be impossible. But nobody had reckoned on the mountain-moving determination of Tan Sri Lim Goh Tong. In 1981 the first hotel was opened. Today multiple hotels and apartment blocks crowd together with giant, world-class, indoor and outdoor theme parks, on the mountaintop. Whether you swing up to Genting Highlands Theme Park on the Skywalk (the world’s fastest and South-East Asia’s longest cable-car system) or wind up to it on your tour bus, you’ll enjoy stunning vistas over the magnificent rain-forested hills and valleys. It’s worth the trip, just for this. It’s a precious last glimpse of ordered, natural beauty, of soft colours, subdued sounds and gentle movements. Up on the summit, nothing is real. Like the true face of an aged courtesan, the shabbiness and ugliness of Genting Highlands Theme Park is concealed in the distracting flash of neon lights, with the ugly undersides of buildings, the wires, the fans air conditioners hidden in shadow. The grind and rumble of machinery is covered by the shrieks of roller coaster riders and blaring musak. Inside, escalators, slope in ten different directions. People hurry up and down. In restaurants, like huge eating stadiums, frenzied waiters rush to and fro, clattering plates and packing holes in buffets with more and more food. Games arcades boom and vibrate with the disquieting sound of electronic battles; the rattle of gunfire, the whistle of missiles, bombs, explosions, robot screams. The pokies clatter and ping. Carousels, hurdy gurdies and merry-go-rounds pump out nursery rhymes. Hearty Disney characters hand out sweets, shake hands and startle kids. On an avenue of world wonders, an imitation Eiffel Tower glows against a backdrop of electric stars while nearby, a pretend Big Ben chimes the hour and a gondolier with a false moustache lip-synchs a canzone as he rows a faux gondola along an artificial canal. But still, discounting the zombies in the games arcades, the faces that slide past on the escalators, swoop by on the roller-coasters or gaze up at the Eiffel tower, are the faces of people who are having fun. 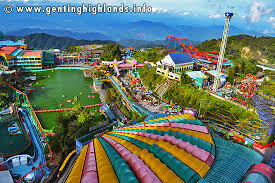 Genting Highlands Resort and Theme park is fun and what’s more it is affordable fun. Visitors flock to it in their thousands every day and in their millions every year; many of them tourists but most of them are the ordinary Malaysians – mums and dads, kids, young couples, teenagers and grandparents – of Sri Lim Goh Tang’s vision. From the modest kampong set up in the 1820s by Malay settlers from Sumatra, Kuala Lumpur has developed into a thriving, twenty first century metropolis which can boast some of the world’s most impressive architecture. Although some buildings, like the Menara KL and the Petronas Towers, can be seen from the shopping centre or from the hotel window, it’s worth venturing into the streets and braving the rather scary and incredibly noisy traffic to get a different perspective. It’s also worthwhile taking a stroll to look at some older, less prominent, but by no means less impressive, buildings. The Petronas Towers is KL’s most famous landmark. 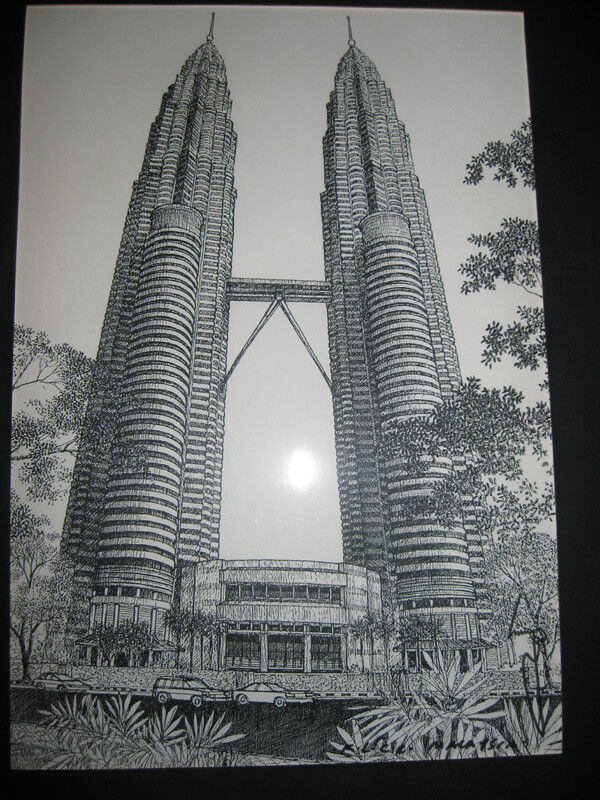 It was designed by the Argentine-American architect Cesare Pelli for the Malaysian oil company Perolium Nasional and was constructed between 1992 and 1998. Its twin shafts, glass curtain walls and scalloping are distinctive but its footprint; an 8 sided star with rounded nodules is a common feature of Islamic architecture. It is this blend of innovation and tradition that make the twin towers such a fitting symbol for the Malaysian nation. It has rapidly become one of the world’s most photographed buildings and its fame was increased even further by the Sean Connery/ Catherine Zeta-Jones film Entrapment. Although the Petronas towers have now been surpassed as the world’s tallest building they still remain as the world’s tallest twin towers and as an architectural icon. The Menara KL which doubles as a communications tower and observation post is another example of the blending of modern functional architecture with traditional, Islamic decorative features. By day it is the conventional telecommunications tower with a long shaft, followed by a pod and topped with antennae. But by night it is lit by a typically Islamic checkerboard pattern of lights which shine like jewels against the sky. The Kuala Lumpur Railway Station, on Jalan Sultan Hishamudda is as breath-takingly beautiful and extraordinary in its own way, for its own time, as the Petronas towers is, in its distinctive fashion, in this time. It was designed by the British architect, Arthur Benson Hubback, who had served in India and brought a wide knowledge of Anglo-Asian architecture to the project. The station’s style, labeled Neo-Moorish, Indo-Saracenic or Neo-Saracenic, was common at the time and incorporates typical Islamic turrets, arches, checkerboard patterns and mosaics with touches of late Victorian grandeur. Although the station no longer echoes with the whistle and hiss of steam and the clank of iron, it is preserved for posterity as a museum. Another of KL’s landmark buildings is the Royal Selangor Club which was once the domain of the pink gin, the panama hat, the Somerset Maugham suit and the white glove. It’s a long, low, white, mock Tudor structure with a red-tiled roof, set in an expansive lawn. You can almost hear the echoes of ball on bat, cries of “Howzat!” and restrained applause. The British flag was lowered here for the last time in 1957, when independence was declared and Malaysia was born. The site, originally called Selangor Padang was re-named Merdeka Square. The old building serves as a backdrop to the new nation’s annual independence or Merdeka celebrations. These are just four of KL’s great buildings. There are hundreds more, equally fascinating some of them large and modern, but many of them modest and ancient. They all have their own special stories and they are all part of the multi-cultural history of the city and its people. Today, Kuala Lumpur echoes constantly with the sounds of construction as it continues to grow and its architecture continues to develop. Architecturally, the Seri Melayu is a showcase of Malay traditions. Made entirely from local timbers, it is styled on the rumah kampong the old Malay house, with elongated windows and wide eaves. The gabled roof, with the traditional Tunjuk Langit at its apex, is inspired by the dwellings of the Perak and Malacca. A tiled Malaccan stairway leads up to a wide verandah with carved rails. Tall wooden doors, thick with intricate carvings, open into the restaurant’s richly paneled lobby. The huge dining hall is designed and decorated in the luxurious style of the Malay Istana or palace. Its walls are paneled in wood and along its centre are four elaborately carved columns or Tiang Seri. At the ceiling the carvings merge and blossom into a giant hibiscus. The central column is another feature of the traditional rumah kampong and in the old Malay home it was of great importance and significance as the mainstay of the house. If the Seri Melayu’s décor evokes the ambience of the Istana, its buffet of gourmet Malay cuisine evokes the generous traditions of palace hospitality. Presentation, variety and abundance are hallmarks of this extensive, colourful, sumptuous feast. Catering to local gourmets as well as foreign tourists, there are dishes to tempt and please all palates, from the afficiando to the initiate. There are satays, laksas and redangs, in a dozen different forms, and as many other ikan, goring and acar items. The desserts are delicious and include kueh mueh (little local cakes) and tempoyek (fermented durian) Choice is difficult and over-indulgence a real hazard. 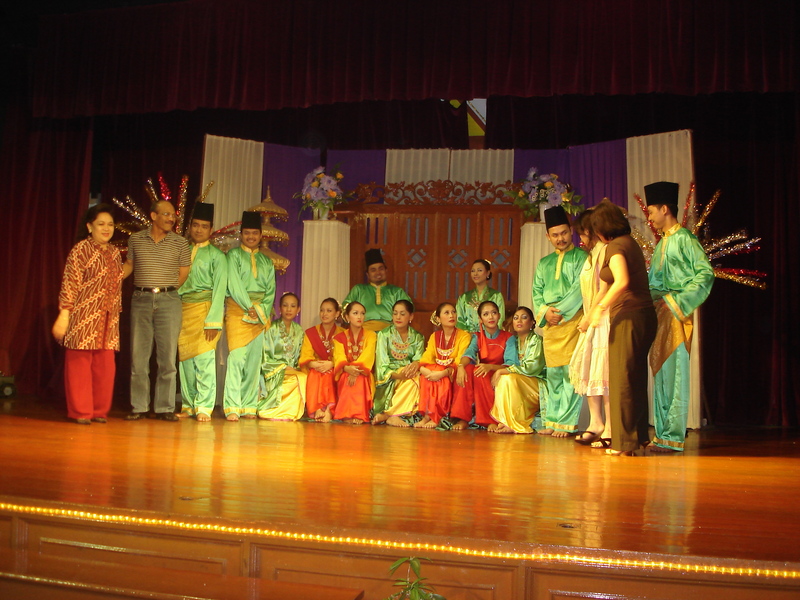 The Seri Melayu’s cultural performance of Malay music and dance is another kind of feast. Featuring some of Malaysia’s famous folk dances, accompanied by the traditional string instrument and drums, in a parade of gorgeous costumes, it is a breath-taking spectacle of sound movement and colour. For the tourist an evening at Seri Melayu is a total, traditional Malaysian cultural and culinary experience, in a setting typical of old Malaya. Magical! But please, don’t wear shorts or you’ll be obliged to don a sarong before you enter! Just as Malaysia’s multi-cultural population is reflected in its art, architecture, cuisine, festivals and customs, so is it reflected in its fashions. Any crowd in Kuala Lumpur is an interesting mix of sari, cheong sam, busana Muslim, western dress, as well as stunning, uniquely Malaysian fashions like the baju batik, the baju kebaya, the baju kurung and the baju kebarung. The centuries-old trade with India, China, the countries of mainland South-East Asia and the Indonesian Archipelago contributed greatly to the development of Malaysia’s clothing traditions. Along with textiles such as silk from China and cotton from India, techniques of decoration printing and dyeing were passed along these ancient trade routes; techniques like embroidery, appliqué, beading, and, most importantly, the Batik method of wax printing that has become a hallmark of Malaysian fabric design. 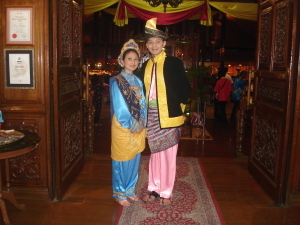 Historically the baju, or sarong type skirt was the main attire for both men and women. With it, women wore a kemban or bodice wrap. However, in the 1900s it was deemed inappropriate by the Muslim Sultan of Jahore and thereafter women began to wear the Kurung, or long-sleeved matching tunic, with the baju. The resulting ensemble, now known as the baju kurung has evolved constantly over the years. Today’s model is a floor-length sarung and matching long-sleeved tunic made of silk and worn with a colour co-ordinated selandang, or headscarf. It still has the traditional round neck edged with a distinctive “eel-bone” embroidery stitch. Colours vary according to the fashions and tastes of the particular times. 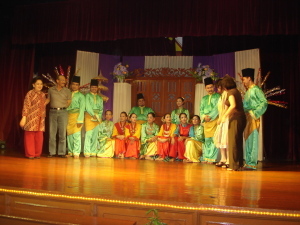 The baju kurung is the most typically Malaysian national dress. The sarung kebaya, or sarong with blouse, is another of the older forms of traditional dress. Traditionally the kebaya was worn with a sarong of floral patterned-cotton batik, hemmed into a cylindrical shape, which the wearer stepped into. It was then folded left to right, tucked in and worn with a silver or gold chain belt. Beautiful examples of modern sarung kebaya can be seen in the uniforms of the hostesses on Malaysia Airlines. The kebaya was adopted and adapted by the Nyonya women of the Peranaken (Straits Chinese) community. The Nyonya kebaya was a long-sleeved blouse made of diaphanous fabric, pleated above and below the breast. In the 1940s the Kebaya Sulam or embroidered kebaya appeared. It was made of silk, voile or kain rubiah, its borders were embroidered with silk thread of various colours, or appliquéd with lace and it was fastened with a keransong or chain of three brooches. Kebaya of the later forties and fifties had even more elaborate embroidery with cut through lace-work and tee too bang or spider web lace. The original Nyonya kebaya was a work of art, a creation of timeless beauty, translucent, figure-hugging, elegant and feminine. Today descendents of the Nyonya continue to craft these beautiful kebaya in the tradition of their grandmothers. Made of voile or kasar robia, non-iron Georgette or Shantung, they still have the authentic, narrow, slimming Princess cut back and French seams. Modern technology now allows for a greater range of patterns and motifs such flowers, butterflies and insects. It has also made the process of embroidery faster and easier but even so, a Kebaya is still a time intensive labour of love and the price reflects this. Sadly, the kebaya has now fallen out of favour as a public garment and is reserved for festive and formal occasions within the home. The baju kebarung is a combination of the the baju kebaya and the baju kurung. In the 1950s they were made in subdued pastel colours but today’s baju kebarung are in bold vibrant silks with large floral patterns and matching headscarves. The Baju kebarung is the feminine fashion of choice at Ramadan, when most Malaysian ladies will head for the shops to buy a new outfit to wear to family gatherings. At public functions, it is recommended dress. The Baju kebarung is worn by Chinese, Indian and Malay alike and has become a unifying symbol of Malaysian women. In an age where business suits, jeans and t shirts seem to be colonizing the world, it is refreshing to walk among the vibrant, colourful, feminine and diverse fashions of Malaysia.